Today is September 20. Welcome to Arnhem. Operation Market Garden, in 1944, was the largest airborne invasion in history, and it failed. General Montgomery brushed aside Eisenhower’s and others objections to his plan to sneak into Germany by capturing the Rhine bridge at Arnhem. It soon became clear that a plan that called for sending in paratroops in two separate waves over two days, forty miles from the target, would not hold the element of surprise. German Panzer and grenadier units blanketed Arnhem, then began to counterattack. 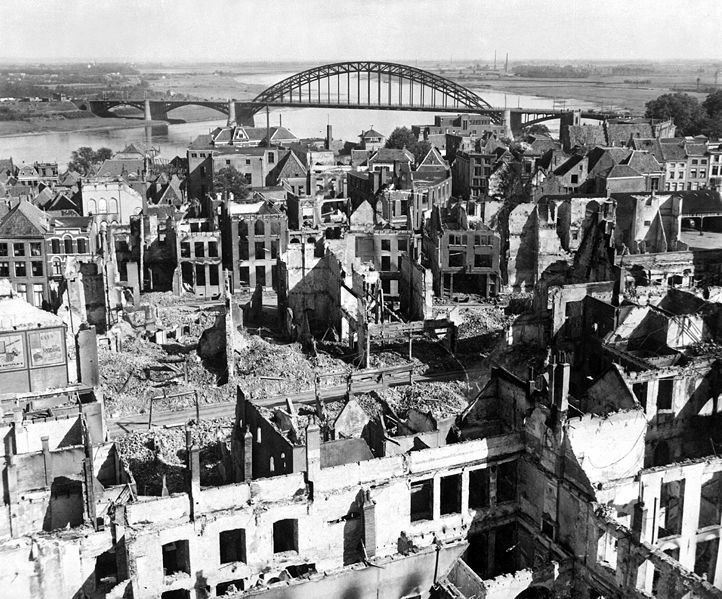 By September 20, most British soldiers in Arnhem had been forced to surrender. Further away, allied forces began to evacuate the men on both sides of Dutch rivers and withdrew toward Nijmegen. By September 25, the battle was over, the gamble having failed due to planning. British troops were marched to captivity in Germany. Allied cemeteries were built in Holland. Germany retaliated by shutting down the Dutch rail system, preventing the transport of food and clothing during the worst winter of the war. Not surprisingly, more civilians died than soldiers. ← This day: July 15, in Paris — Quid plura?